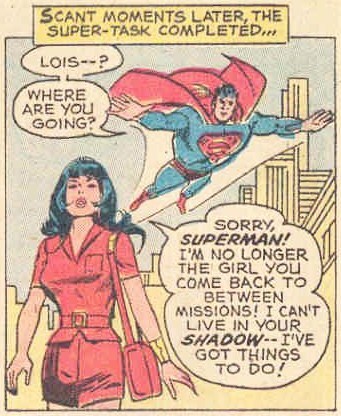 At first glance, the Silver Age Lois Lane had a lot going for her. She was an ace reporter for the Daily Planet, appeared regularly in various Super-books, and in 1958 she launched her very own series. Unfortunately, that series was called Superman’s Girl Friend Lois Lane. She didn’t even get top billing on her own book, and the stories consisted of Superman regularly setting up elaborate ruses to teach the impetuous and reckless Lois the error of her ways. Superman’s chastisement often reduced Lois to tears, and she spent most of the Silver Age sobbing. Long gone was the plucky Lois Lane of the Golden Age. Back then, she was a spunky reporter who climbed her way up from the lovelorn column to the front page. During Lois’ first encounter with Superman, the Man of Steel cautioned Lois: “I’d advise you not to print this little episode”, but the very next morning she was at her editor’s desk trying to get the story published. While her progress may have been slow, Lois fought tooth and nail against anyone who tried to keep her down. In comparison, the Silver Age Lois came off as a whimpering pushover, which leads many today to write off Superman’s Girl Friend Lois Lane as typical 1950s patriarchal, marriage-centric schlock. 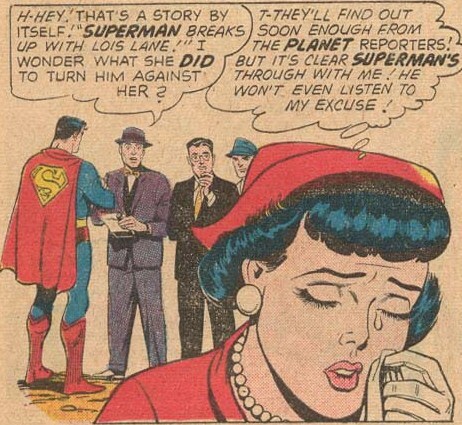 The Silver Age Lois didn’t seem to have any feminist gumption, but her readers may have found a subversive message among her tears. In the “Letters to Lois” column in SGFLL #38, a reader named Jim summed up the situation: “Dear Editor: Why does Lois always cry, cry, cry?” Frankly, it was hard to miss, even from the first issue: Lois cried in every single story in SGFLL #1. She sobbed when she thought her actions led to the death of a Count (it was all a ruse by Superman), bawled when Superman didn’t like her cooking enough to fall in love with her, and wept when she thought she’d turned into a witch (another ruse from Superman). Lois’ tears were a hallmark of the book from day one. An ad for Superman’s Girl Friend Lois Lane stated that Lois’ ambition in life was “To become Mrs. Superman”, so anything that jeopardized her marriage prospects sent Lois in a downward spiral. Ultimately, Superman remedied both of these situations, reversing the growth ray and snapping her out of her hypnosis, all while lecturing Lois about how she deserved to get into these predicaments because she was such a nosy reporter. Her automatic reaction in both incidents was to leave Metropolis. In the Kryptonite vision adventure Lois cried through the entire issue then moved to Alaska to avoid hurting the man she loved. Ultimately, Clark and Jimmy showed up with an “antidote” that took away the Kryptonite vision. Nobody told her that Superman had planned the whole thing. He brought in the artifacts knowing that Lois would touch them and develop a harmless green eye ray. He then pretended to be hurt by it, and let her feel awful and move away, all to teach her not to touch his stuff. Ignorant of the entire scheme, the story ended with Lois flying home to Metropolis, eager to again see the man she loved. Superman didn’t even have to get upset for Lois to burst into tears; she would cry in anticipation of his displeasure. Superman berated her so often that she just expected it at every turn. Sometimes she’d even chastise herself before Superman had the chance: When the Count was “shot” in SGFLL #1, Lois exclaimed “How stupid I was to try a hoax like that! I’ll never do it again!” Lois was never mad at Superman for setting up these elaborate ruses. She was only ever mad at herself for not being what Superman wanted her to be. It’s clear that Lois’ frustration and despondency showcased a systemic problem. The series served as a mirror that distilled and reflected back a hyper-reality to the reader that exposed the cruelty and aggravations of the patriarchal, limiting world of the 1950s. 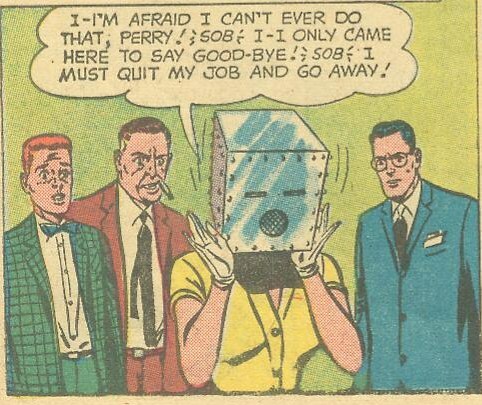 Lois was trapped in a very small box, expected to be a demure, complacent woman and be happy in this narrow role, but she wasn’t. Rather than reinforcing the value of conformity, issue after issue showed Lois’ attempts to achieve that ideal brought her nothing but pain and suffering. What readers saw was an ambitious, hard-working woman trying to win over the man she loved who was constantly in tears. Any time she tried to take initiative and go after her “dream” life, patriarchy in blue tights showed up to tell her she was stupid or, even worse, disobedient. Lois cried because it was all she could do to show that she was stuck in an oppressive system that she clearly hated. Tears were the only weapon Lois had. Now, none of this subversion was intentional on the part of the series’ writers or artists. When Superman’s Girl Friend Lois Lane debuted, the industry was still in the early days of the new Comics Code Authority. Senate hearings on juvenile delinquency that implicated comic books had just rocked the industry and publishers clung to their new content code for dear life to avoid further scrutiny. All of their comics were as innocuous as possible, strongly reflecting the dominant values of the time so as to be as completely unobjectionable. They stuck to rules like “The treatment of love-romance stories shall emphasize the value of the home and the sanctity of marriage” and “Respect for parents, the moral code, and for honorable behavior shall be fostered.” No one was trying to incite any rebellion against authority. Instead, Superman’s Girl Friend Lois Lane was the quintessential Silver Age comic, perfectly encapsulating the gender dynamics, campiness, and strict adherence to dominant values that characterized the post-Comics Code years. It took some time, but readers like these eventually got to see some big changes for Lois. This new, independent Lois wanted nothing to do with Superman’s meddling, and instead worked with her girlfriends to get good stories and escape dangerous situations together. While Lois ended up with Superman years later, a shift had occurred. Lois was her own woman, even when she dated Superman again, and in 1978, Margot Kidder’s brash and assertive Lois Lane cemented this image in Superman: The Movie. The new take on Lois in 1972 was clearly inspired by the many women taking to the streets to demand their rights as part of the women’s liberation movement. But in turn, the women’s liberation movement was fueled by the tears of Lois Lane. The girls who read Superman’s Girl Friend Lois Lane in the 1950s and saw her despair with the oppressive, patriarchal systems of the time were the same generation who grew up to protest these systems in the early 1970s. It wasn’t just Lois, of course. It was every book, magazine, and TV show that reflected these values back at them, as well as their own lived experiences chafing under limiting expectations. At first glance, it’s easy to roll our eyes at the Silver Age Lois and instead focus on her more progressive, assertive incarnations as we celebrate her 75th anniversary, but we shouldn’t dismiss this era and the lasting lessons her tears held for her young readers. 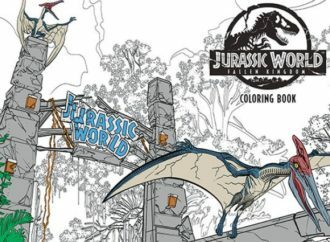 Tim Hanley blogs at Straitened Circumstances and writes the monthly Gendercrunching column at Bleeding Cool. Lori Wozney is a PhD in educational technology and writes about sci-fi, comics and cultural studies.